Whenever I pass the Russian government building, known as the "White House", I stare up at the gleaming white marble panels and the huge golden double headed eagle. And my mind switches back 10 years in time. Because in October 1993 it was right here, on the banks of the River Moscow, that Russia stood on the brink of civil war. Back then this building was used by Russia's former parliament - the Supreme Soviet. It was locked in a power struggle with President Boris Yeltsin. Mr Yeltsin had accused it of stalling his economic reforms. He'd issued a decree disbanding it. But many of the deputies simply refused to leave the building. They accused Yeltsin of breaking the law. They even appointed their own president - Alexander Rutskoi. There was a tense standoff. And then, on 3 October, an explosion of violence. Forces loyal to the parliament took over the Moscow mayor's office. Then they moved on to the Ostankino TV centre. There was a fierce gun battle with security troops defending the building. Dozens of people were killed. Boris Yeltsin resolved to crush the rebellion. Early on 4 October tanks opened fire on the White House. 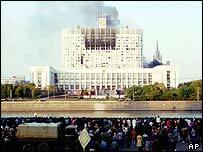 The parliament which had helped bring Boris Yeltsin to power was soon in flames. The assault lasted several hours. It played out live on TV screens around the world. By the end, at least 140 people were dead, the parliament had surrendered, and the White House was charred and smouldering. "I believe we had no choice but to act as we did," Sergei Filatov, Boris Yeltsin's former chief of staff told me. "We were forced into it by the violence of the other side. If they had been allowed to win, the threat to democracy in Russia would have been enormous." But 10 years on, most Russians don't agree. A recent survey found that four out of five Russians believe Boris Yeltsin was wrong to use tanks against his parliament. There's a growing feeling that Mr Yeltsin was more interested in keeping power, than in defending democracy. "There is widespread disappointment with the personality of Yeltsin and all that he is done," says Moscow journalist Alexei Pushkov. "If Yeltsin was such a big democrat and the people around him, how did it happen that Russia has become one of the most corrupt countries in the world? "How did it happen that in Russia they have gangster capitalism and quasi-democracy? A lot of things happened in Russia that had nothing to do with democracy." Russia changed profoundly after October 1993. The country gained a new constitution and a new parliament - the Duma - but from now on it would be the president who had most power. "We had more opportunities for opposition and for parliament before October 1993 than now," Alexander Buzhalin told me. Alexander was an advisor to the Supreme Soviet back in October 1993. "Now parliament has become a very limited structure. "All real resources, control over mass media, control over financial resources is concentrated in the hands of the president and presidential administration." But the struggle for power in Russia continues. Not out on the streets. Not with guns or tanks. Today it's more behind the scenes in the corridors of power. Hidden away from the public, different groups, different ideologies are fighting for influence over President Putin. Battling to affect which path Russia takes. That's something which this country is still struggling to decide.